Private 50ft long pool and massive game room compliment the private beach access! Spoil your large family reunion group rotten (or any other large gathering of friends)!! With just 5 houses to the private beach access on a gated street with no busy roads to cross - introducing the Boomerang Reunion! The backyard and game room!! No typical "Destin pea-sized" swimming pool here. We ripped that out and replaced it with a largest private pool in the area (or pretty much all of Destin for that matter) 49x20 custom pool with a 14 person hot tub adjoining the in-pool table/umbrella and stools. It also features a large tanning shelf with pop-up bubblers and fountains on the wall - it is the PERFECT pool for large groups! Too much sun? Enjoy the nearly 900 sf game room featuring a pool table, separate ping pong table, air hockey, foosball and 12' shuffleboard tables as well. There is a full sized refrigerator to stash your cold beverages and also a 55" TV to enjoy the big game while enjoying your big games! The attached Xbox room completes this entertainment Shangri-La indoors, but right outside, enjoy the pool or professional glass basketball goal in the driveway. Inside, a finely appointed, with ample room to gather, entertaining area awaits you. Flat screen TVs in every bedroom and living area. Wood-style tile floors throughout the entire 1st floor including the 4 king bedrooms, as well as on the stairs up to the kids bunk rooms. An extensive video collection as well as games and books for all ages. Enjoy the comfort of the premium bedding sets. Each livable floor has its own HVAC unit for comfort throughout. Amenities galore, we want you coming back! 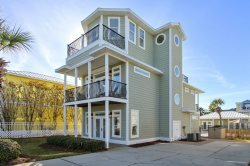 Situated just 5 houses or 600 ft between you and the sugary white sand beaches that Destin is famous for, on a private neighborhood exclusive beach and no streets to cross. The house and gaming area is over 5100 sf with another 800+ sf spread out over 3 balconies and porches! You will enjoy the shops of the Silver Sands Premium Outlets and restaurants just 1 block away. Enjoy watching a DVD on the 65" flat screen from the comfortable and plentiful seating. Or just step out the front door to the covered porch and relax on the porch swing. Enjoy curling up and reading a good novel while the kids and mom or dad are off fighting the waves. The living room flows into the dining area where you will enjoy a fabulous large dining table for 12 with 7 additional bar stools along the counter for plenty of seating. The stocked kitchen is a gourmet's dream! Stainless everything and extensive granite counter tops with plenty of storage, including a large separate pantry. The laundry room is large and offers plenty of ice with the separate ice maker. 1st floor: 900sf game room as discussed above. 2nd floor: Living room with sleeper sofa. Full kitchen and separate Laundry room. 5th private king bedroom. 3rd bunk room with full over full. Full bathroom between the br's with tub/shower combo. This level sleeps 8. Brings total sleeping between 2 houses to 32 plus 2 cribs. The back yard is truly special and a wonderful way to spend the time when you are not at the beach. The largest in area pool is the perfect compliment to our wonderful Emerald Gulf. Combined with the game room you have all the following activities: Pool table? check, ping-pong table? check, 14 person hot tub? check, Foosball/Shuffleboard/Air Hockey? check/check/check. Basketball area with glass backboard? check. Activities for everyone and we also feature a gas grill and 2 outdoor showers to clean up with before going back inside: one in the front for coming back from the beach and one in the back. The shaded porch offers a nice area to enjoy a snack or meal. With plenty of resort quality Breezesta lounge chairs and Adirondack style chairs to accommodate larger parties, 2 Breezesta outdoor dining tables each with seating for 6 and umbrellas, be as active as you want or just soak up the sun. Bed linens and bath towels (please supply your own pack-n-play linens). We also start you with several beach towels. Private pool. The private pool can be heated from October 1st - May 1st. The hot tub can be heated year round. *Please note there is an additional fee to heat the pool and/or hot tub.